I don’t have a chronograph. How can I calulate the FPS of my boat without one? 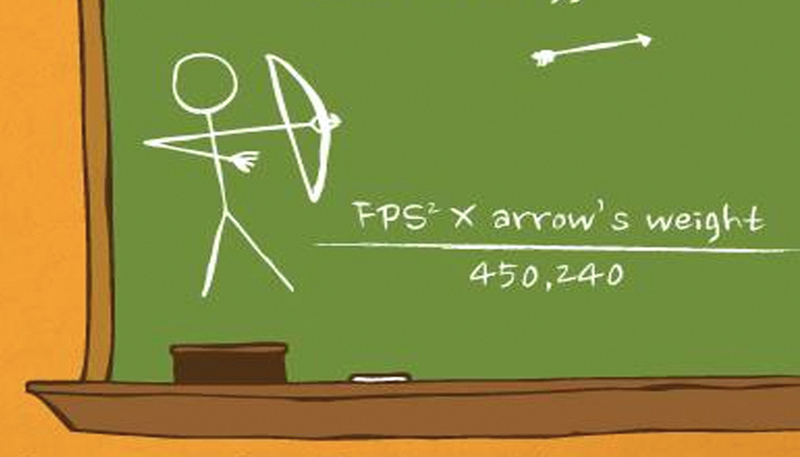 Read this blog: Calculate FPS of Your Arrows Without a Chronograph. What’s the minimum amount of kinetic energy needed to kill a deer? Many states set minimum draw weight requirements for bowhunters to adhere to. But draw weight alone is not an indication of penetration power. There are other variables to consider, such as what arrow and broadheads are used and the distance of the shot. Gold Tip, an arrow company, recommends a minimum of 25 ft-lbs of kinetic energy to ethically bowhunt deer. They also state 55 ft-lbs of kinetic energy would is sufficient for most popular North American game species. My bow is set at the maximum draw weight, can I increase kinetic energy in any other way besides increasing draw weight. Kintetic energy is effected by mass (an arrow’s weight) AND speed (draw weight). If you would like more kinetic energy, but are at the maximum amount of draw weight you can comfortably pull back, a heavier arrow will increase kinetic energy produced. But keep the laws of momentum in mind. A heavier arrow loses speed (fps) faster than a lighter one, so your bow’s sight will need to be adjusted and the maximum distance of shots will need to be considered. Use the combination of speed and weight that generates the highest kinetic energy from your bow. I have found the combination of speed and weight that generates the highest kinetic energy from my bow, but am still worried about penetration issues. What can I do? Choose your broadhead carefully. Usually, the larger the cutting diameter is on a broadhead, the more kinetic energy it needs to penetrate. The design and cutting diameter of a broadhead relates to sectional density. The Wasp Jak-Hammer, with a 1-3/4-inch cutting diameter, or the Wasp Z-Force, with a 1-5/8-inch cutting diameter, will perform best when shot from a bow producing at least 55 ft-lbs of kinetic energy. If you are on the lower end of the kinetic energy spectrum, use a broadhead with a moderate cutting diameter – something between 1-inch and 1-1/4. Wasp Archery offers many fixed blade and mechanical broadheads in this range of cutting diameters. There are many factors to assure you are shooting an arrow and broadhead with the characteristics needed to compassionate kill an animal. It’s not just the poundage of your bow. Stay tuned to Wasp Archery as we continue to post blogs on kinetic energy, momentum and sectional density so you can maximize the effectiveness of your bow setup and increase success in the field.